Viola repertoire for individual lessons will be different from teaching class group lessons as a different style of teaching technique required. Using the correct viola repertoire throughout a students or young professionals development, is crucial. Although this statement may be obvious, choosing the right repertoire can be seriously misjudged at times. Viola repertoire should always encompass areas of posture, scales, studies, sight reading and standard repertoire on a regular basis. 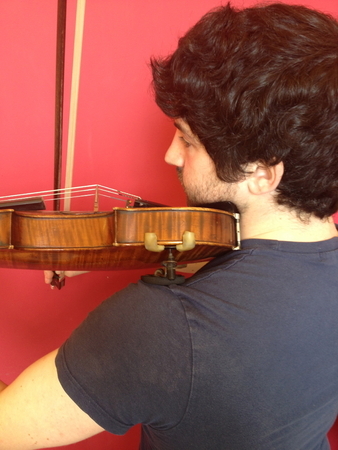 Classic position using a shoulder rest. Chin lightly placed on the chinrest. Relaxed position of the neck. If an advanced violinist wishes to change to the viola, then the areas of basic technique - tone production and repertoire should be firmly established. However, if the student is turning to the viola at a less advanced stage, then any attempt to be too ambitious covering these basic skills can lead to problems later on. Teachers who have their own preferred repertoire covering the basic elements if worked regularly, will enable the student to make solid progress. Quick studies or duet work should also be regularly undertaken during lessons. A comprehensive viola repertoire list should be kept and always added to, making sure it is balanced with technical work listed first. It will then be possible to see at a glance if the two main genres of music i.e. Baroque and Classical sections are being neglected. With less advanced students original repertoire in these genres is limited. It will be necessary to use arrangements and transcriptions, so careful selection in matching ability to repertoire is crucial. 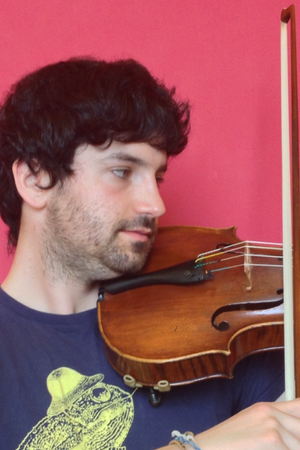 Viola auditions should be undertaken for local Orchestras or Saturday specialist Schools. In some instances graded viola repertoire may be requested, as this will be a reliable guide for the adjudicator. The correct standard of repertoire played competently will be more successful in auditions than repertoire that is too ambitious. This also applies to GCSE and A level choices. For the advanced student or professional audition, the viola concerto repertoire is usually stipulated. Depending on the type of orchestra i.e full or chamber, the right choice to suit the type of orchestra is an important decision. Solo Bach, either the Stamizt or Hoffmeister D major Concertos, and either the Bartok or Walton concertos are usually required. It is imperative to have this repertoire at ones fingertips. Preparation is the key factor in order to succeed with viola auditions. Orchestral extracts should be systematically studied from the set viola repertoire list and prepared with the same dedication as solo repertoire. Quick studies or duet work should also be regularly worked on during lessons.